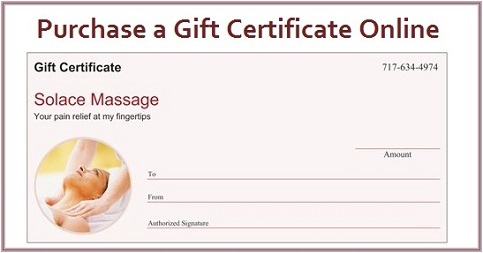 Click the Gift Certificate below to purchase online. Use offer code ONLINE10 to receive a 10% discount. Integrated/Combination Massage - $62/hr; $40/half hr - A light to moderate touch mixed deep tissue where needed. Relieves muscle tension and pain, relaxes the mind and body. Escape reality, while making an investment in your overall health. Recommended for those with chronic pain. Hot Stone Therapy - $110/90 min; $92/60 min - Penetrating heat from smooth, oiled and warmed stones is used to relieve tense muscles and sore joints. Combined with integrated massage techniques, this creates an unforgettable and thoroughly relaxing experience. Facial Massage/Foot Massage - $52/35-45 mins - Help fight gravity and the signs of aging while you pamper yourself with a relaxing facial massage. Hydrotherapy towels are used in conjunction with massage to rejuvenate the skin. Followed by a fabulous foot massage for total body relaxation. Can be added to an integrated therapeutic massage. Facial Massage - $46 35-40 mins - Relaxing massage for face and neck. Rejuvenate the skin while letting go of stress.